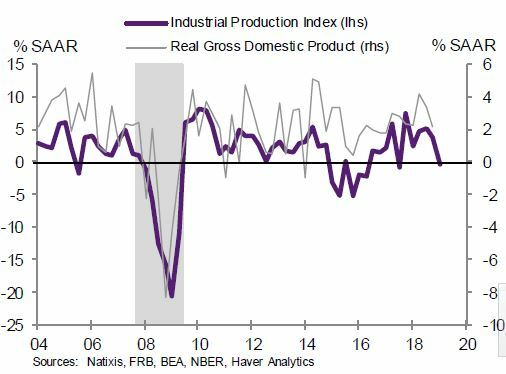 Industrial production was negative in the first quarter, a signal that first quarter growth could be weaker than expected, says Joseph LaVorgna, Natixis chief economist Americas. LaVorgna said industrial production correlates closely to GDP and he said its possible GDP could be flat, compared to his forecast of 1% and other economists' forecast of 2%. Natixis economist Joseph LaVorgna said the Federal Reserve's industrial production index correlates very closely to GDP growth, and the correlation between its quarterly annualized changes and real GDP growth is around 70%. "It correlates to GDP pretty well, and I did notice within the data that there was a big inventory build within the fourth quarter," said LaVorgna, the firm's chief economist for the Americas. "It seems if there was a time that industrial production and GDP would match up well it would be at time when there's a relatively large inventory build," he said. "When you unwind inventory, you would expect to see production slow." LaVorgna is forecasting 1% for first quarter GDP growth, reported April 26, but he said it could be even closer to flat. He added economists' consensus forecast is 2%. "To me the production data suggests there's may more downside risk to Q1 than people currently believe," he said. "We still expect real GDP output in the first quarter to hit 1.5%, but much of the increase will come from a temporary build-up of inventories rather than factories producing more goods," noted Chris Rupkey, chief economist at MUFG. Boeing's decision to halt deliveries and scale back production of the 737 MAX family of aircraft. "While the economy should perform better [in the second] quarter, relative to last, because of a strong seasonal bias for such outperformance, it remains unclear that GDP growth will be robust. Consumer spending has been modest at best, and there has been little evidence pointing to an upswing in capital spending. Consequently, we are less sanguine on the economy's first-half economic performance compared to our peers," LaVorgna noted.